OnePlus started its existence by hyping up the Android community to a completely irresponsible degree in advance of the release of the OnePlus One. Lucky for them the OPO was a pretty good phone. 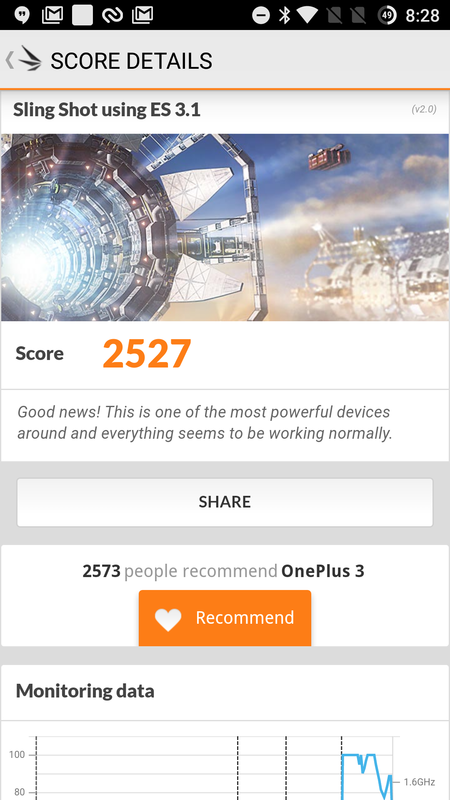 However, the breakdown of OnePlus' relationship with Cyanogen Inc. made the OnePlus 2 a less appealing device. It was lacking in a few hardware areas and the software was very barebones. 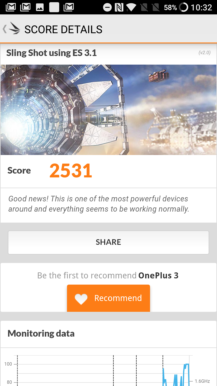 The OnePlus 3 was a clear improvement, but just a few months later OnePlus has given it the boot in favor of the OnePlus 3T. As the name implies, this phone is very similar to the OnePlus 3. In fact, the OnePlus 3T has the same chassis as the OP3 and shares most of the same specs. The big additions here are the Snapdragon 821 (up from 820) and 3400mAh battery (previously 3000mAh). With the spec bump also comes a price bump—the OnePlus 3T starts at $440 instead of $400. I don't know that the additions are going to change the experience, but the OnePlus 3T is still a good deal. OnePlus knows its niche. I'm going to be making a lot of comparisons to the OnePlus 3 in this review, so it's fitting to start with the design. The only external difference between the OnePlus 3 and OnePlus 3T is the color of the aluminum back. The OP3 had a plain aluminum finish, but the 3T is "gunmetal." It's a somewhat darker tone, and it looks nice. I don't think you'd notice the difference unless you'd seen a regular OnePlus 3 to compare it to, but I like it. Everything else here is as it was with the OnePlus 3. The aluminum frame is very sturdy, and it looks classy—maybe a little boring compared to the older OnePlus phones that came with the sandstone backs. You have the option to buy cases with the sandstone material or a few other choices, but they're a little expensive. I'm also not particularly impressed with the quality (I managed to break one of them a few months ago). If you're going to be taking your case off frequently, you should skip OnePlus' shells. 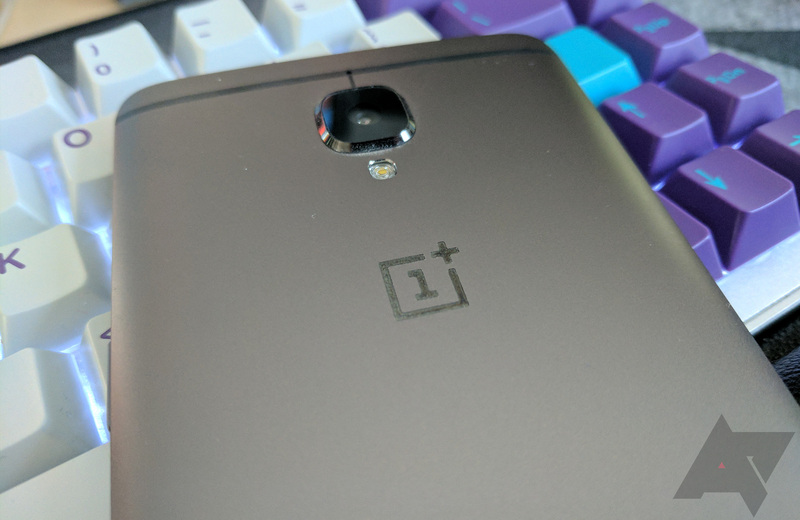 On the side of the phone is OnePlus' signature alert slider. I personally prefer the standard software control so I can set a do not disturb schedule, but I understand the appeal of this feature. The slider and all the buttons on the OnePlus 3T are firm and clicky with no wiggling or looseness, which is something that even some expensive phones don't get right. Despite the larger battery, OnePlus says the OP3T is the same weight as the OP3. I was a little skeptical at first, but I can confirm both phones weigh the same. The OnePlus 3T seems balanced a bit differently. It's not the sort of thing you'd be aware of unless you were holding both phones at the same time. Under the display on the face of the phone are the home button and capacitive nav buttons. I wish that OnePlus had taken the 3T release as an opportunity to make a few tweaks to rectify some of the mistakes from the OP3. The buttons are a prime example. I don't begrudge people who like capacitive buttons more than on-screen ones (I'm not one of those people, though), but you can't deny the buttons on the OP3T are kind of bad. They're indicated by tiny glowing dots that only appear when you've touched them or the home button. So, you just mash one side of the home button, knowing there's a button around there someplace. The small backlit area is also hard to pick out in bright outdoor light. The fingerprint sensor is still fantastic on the OnePlus 3T—it's better than the sensor on some considerably more expensive phones like the Galaxy S7. It's lightning fast and almost never throws up failed reads. OnePlus also didn't make any changes to the display, which is unfortunate. It's one of the places that OnePlus saved a little cash. The 1080p AMOLED is not a bad panel, but at 5.5-inches it isn't as crisp as a 1440p screen, mostly because of the pentile pattern AMOLEDs use. I'm also a little concerned that this panel's density will be too low for VR to be enjoyable if this phone ever gets Daydream support. Cardboard is a more casual experience, so it's not as vital the display looks amazing in VR. OnePlus has maintained the 1080p screen was chosen for battery life, but there are phones with 1440p displays and a good battery life. You'd think with the larger battery, a higher resolution screen would be easy to justify. The most significant change to the OnePlus 3T comes in the form of an upgraded SoC and battery. 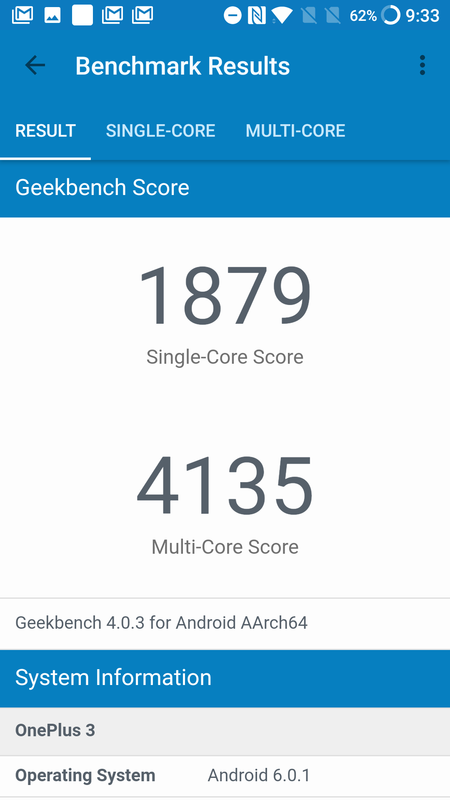 The OnePlus 3 was no slouch in the performance department, but the Snapdragon 821 is one number higher than the 820... so, it's better, right? Technically yes. 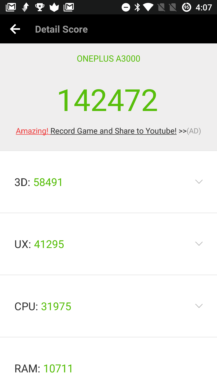 The OnePlus 3T is as fast as phones that cost twice as much. 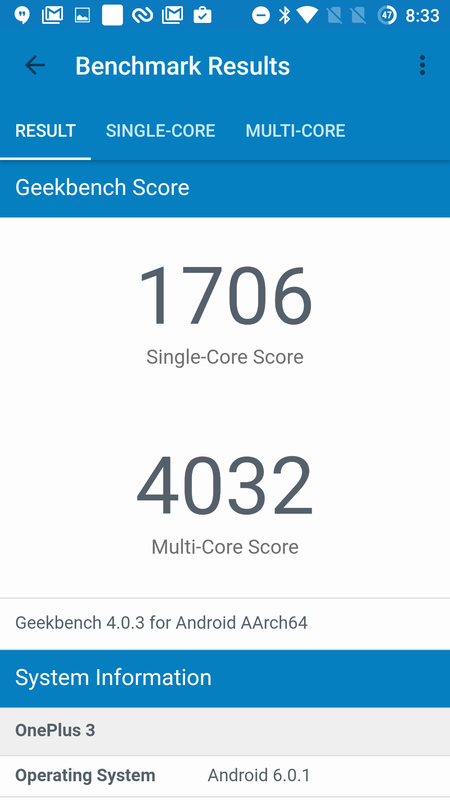 Here are some benchmarks, if that's your thing. 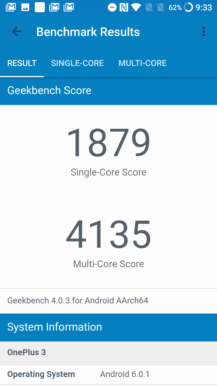 So, on the basis of benchmarks, the OnePlus 3T is a bit faster. 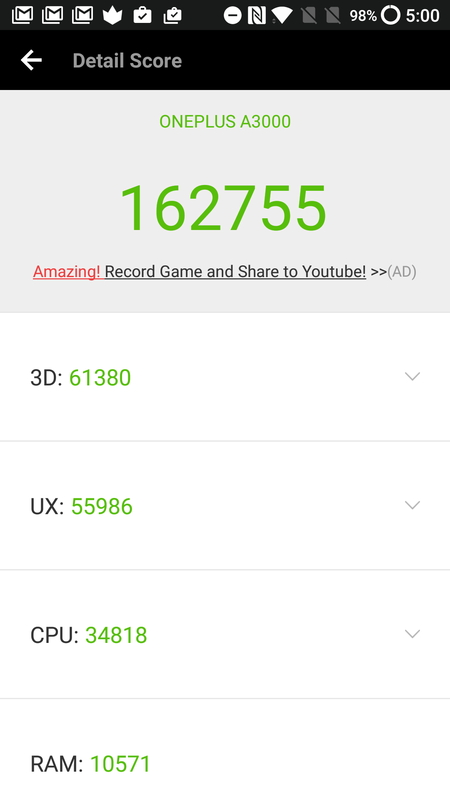 The closest call was in 3DMark because of strangely poor physics performance for the OnePlus 3T. I'm not sure what to make of that, but the frame rate was 5-10fps higher on that device. This should come as no surprise. It's consistently just a touch more snappy. The thing is, you might never notice this difference even if you've used a OnePlus 3. 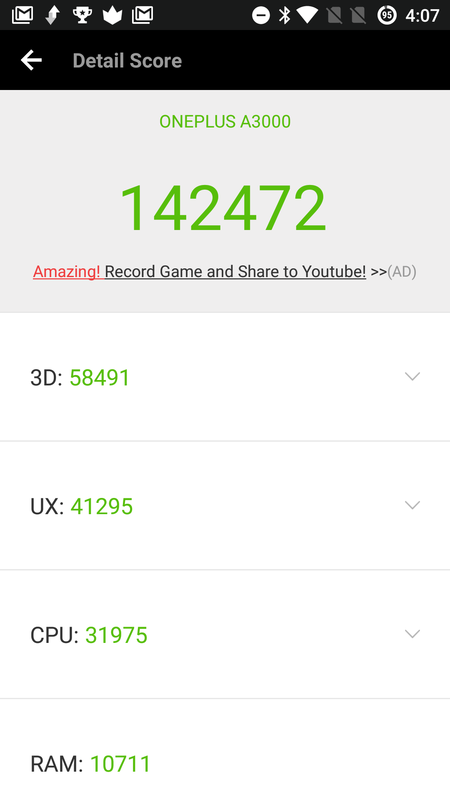 I'm only able to really tell the OnePlus 3T is faster because I have a (freshly reset) OnePlus 3 right next to it. Things like loading apps and processing photos finish a split second faster on the OnePlus 3T. I don't mean to imply this isn't a good thing. Completing actions a fraction of a second faster over the course of a day using a phone can make it a more pleasant experience. 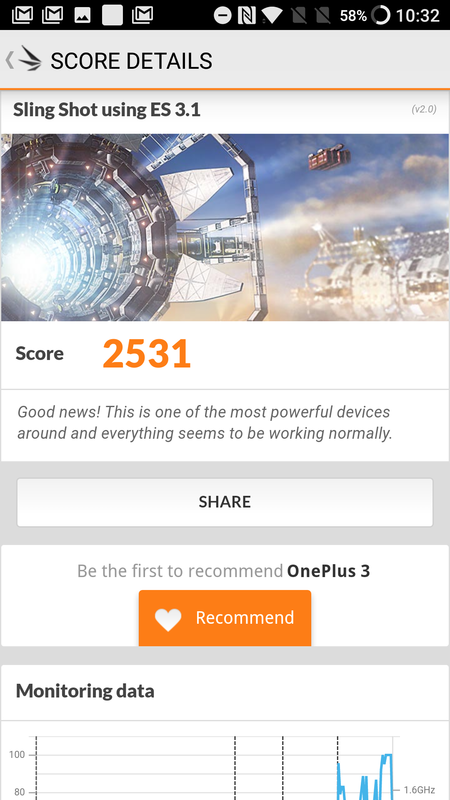 It's simply not a significant enough difference that OP3 owners should be anxious to upgrade. There's still 6GB of RAM in the OP3, and I'll note the company has addressed the multitasking issues I complained about in the original review. The larger 3400mAh battery in the OnePlus 3T does indeed offer better battery life. Again, this is a marginal improvement—it's not life-changing, and you'd probably never notice unless you had a OnePlus 3 to compare the two side-by-side. Like the OP3, the 3T lasts me through a day of moderate to heavy use including messaging, emails, browsing, and some light gaming. Over the course of about 16 hours, I'm seeing five or so hours of screen time. Your usage may very well be different than mine, but I'd call this slightly above average battery life. It's not as good as the Pixel or the GS7 Edge, but it's a solid showing and marginally better than the OnePlus 3. Dash Charge is again something OnePlus is pushing as an advantage, but it's really only superior in the sense that it's better than not having fast-charge technology at all. I've had trouble integrating Dash Charge into my life because even when I am using the OP3 (or OP3T now) full time, I have a tablet that doesn't work properly with Dash Charge. So, if I want fast charging for everything, I need a second cable. I would even trade the extra 2GB of RAM for normal fast-charging. The rear 16MP camera is unchanged. 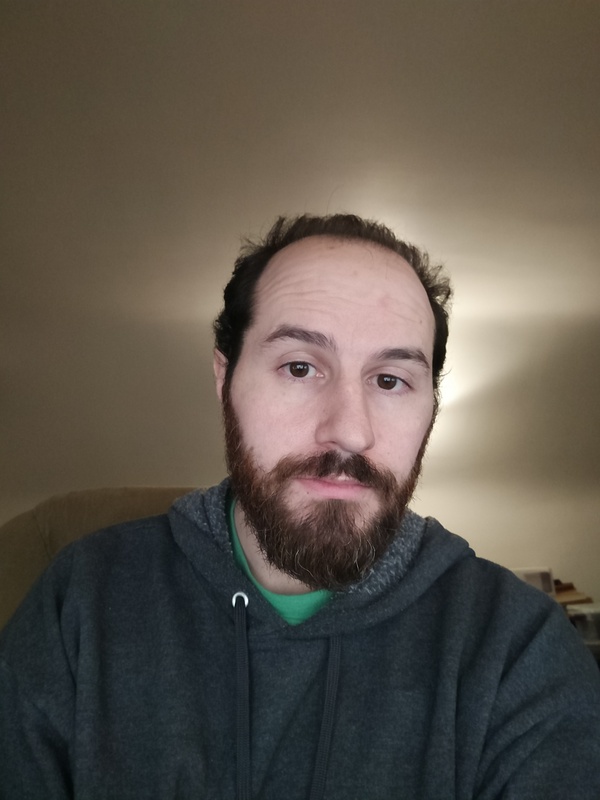 It's a good camera generally. If you want more detail, check the original OnePlus 3 review or Jordan's recent long-term review. 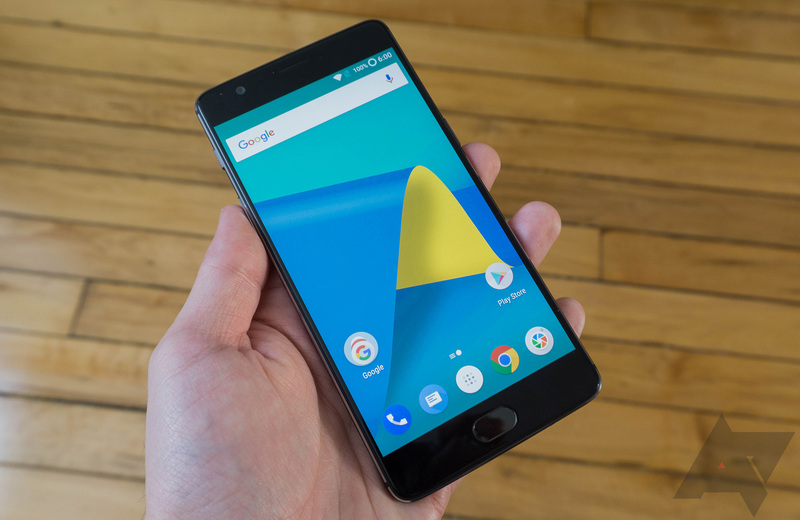 The OnePlus 3T adds a 16MP front-facing camera. That's not something you see every day, the same resolution front and rear cameras. And yes, you can actually tell the difference. 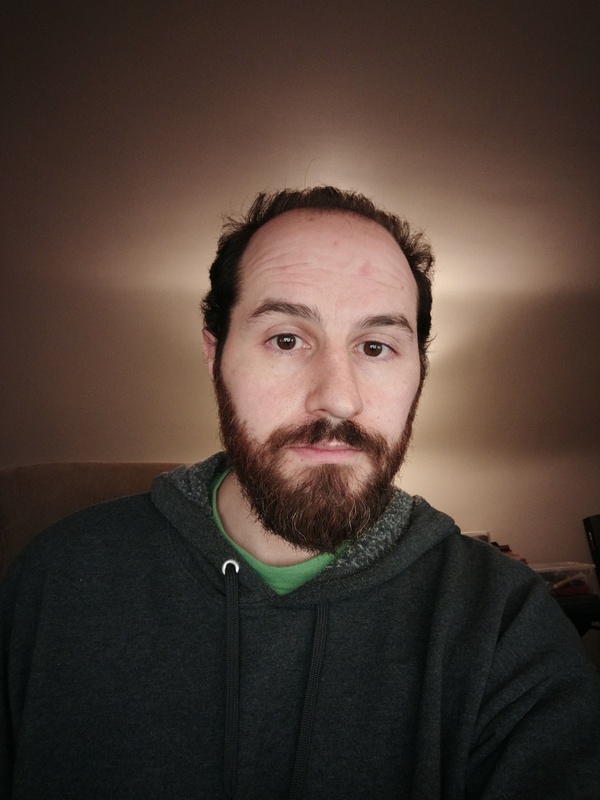 From my testing, the OnePlus 3T's front-facing camera produces brighter images with more true-to-life colors compared to the OP3's. It also pulls in a lot more detail, which is good as OP's image processing can sometimes mush up the finer things. There's not much else to say about this sensor. It's better, but I don't know how many OP fans are buying phones based on selfie appeal. I'm sure OnePlus wanted to launch the OnePlus 3T when it did in order to get it out there for the holidays, but from a purely technical perspective... it should have waited. 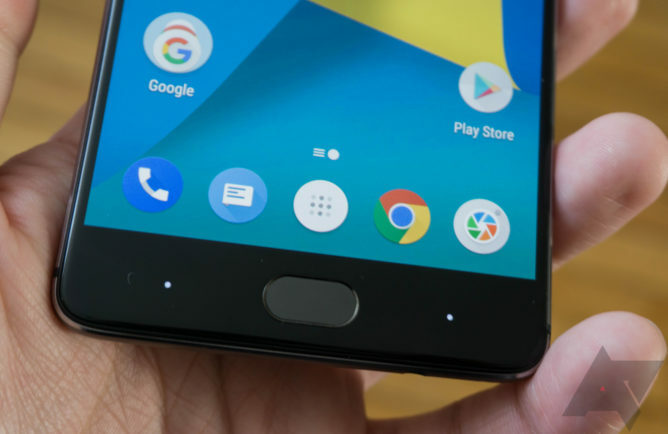 This phone ships with OxygenOS based on Android 6.0.1 Marshmallow, just like the OnePlus 3. 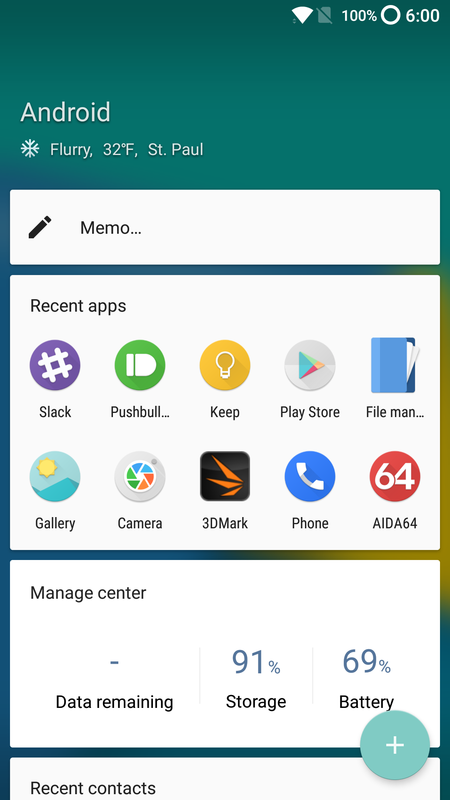 However, it's a subtly tweaked build more akin to what you may have seen as part of the recent community builds of OxygenOS. 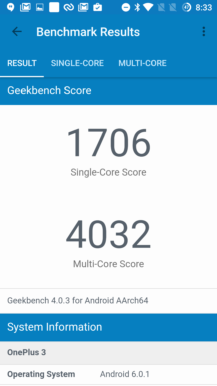 The differences between the OxygenOS builds are mild. One of the more prominent changes includes the Shelf UI on the home screen, which now uses white cards instead of black and includes a new "manage center" widget. 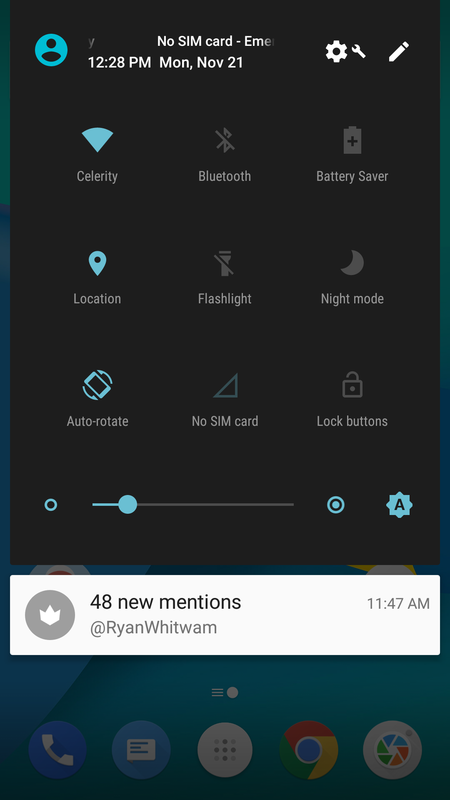 You can still add more widgets of your own, and the whole screen makes better use of space. A few settings have moved around, including the sRGB option. It's now in the main display settings rather than the developer options. 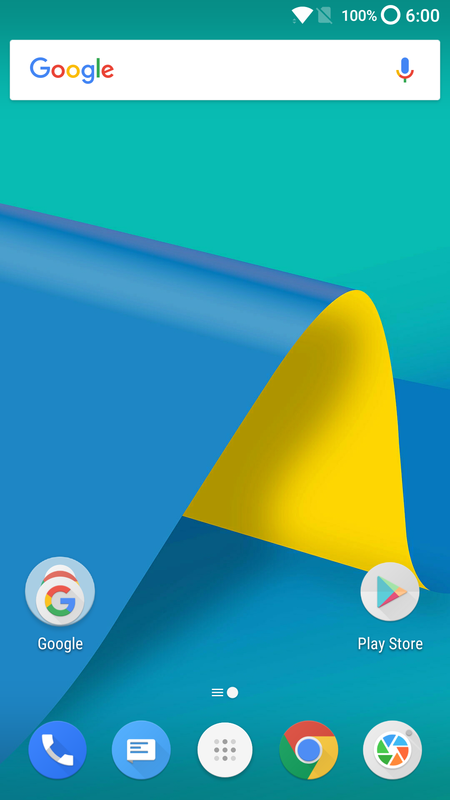 Interestingly, OnePlus has revamped the look of the quick settings to imitate Nougat. You'll also see some minor differences in buttons and animations. OnePlus previously said that Nougat would come to the OnePlus 3 by later this month as a community build, then a final version would be ready late in 2016. 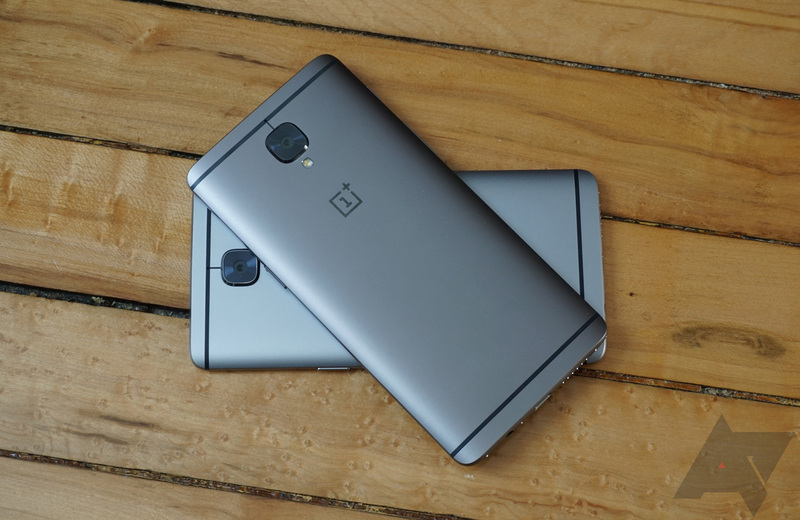 Further, the OnePlus 3 and OnePlus 3T will supposedly be updated at the same time. 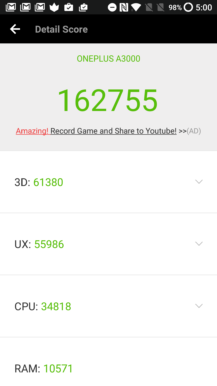 It's up to you if you want to believe all that, but the situation we're in now is that OnePlus has launched a new phone with Android 6.0.1 in late 2016. That just strikes me as odd. 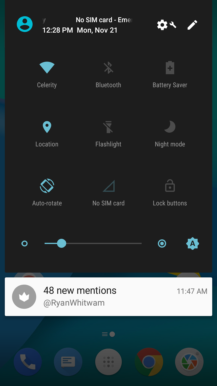 Just to be clear, OxygenOS is generally a solid version of Android. I don't find the UI to be offensive, and there are some cool features like the dark UI mode and the screen-off swipe gestures. I'm not in love with the home screen, but that's really easy to change. So, why create a tweaked version of a phone after a mere five months? OnePlus has its own story on this, which goes something like: the company felt it could offer a better version of its phone with more advanced hardware, but its business model doesn't support selling multiple hardware variants of a device at once. Thus, the OnePlus 3 is out and the OnePlus 3T is in. My personal suspicion is that OnePlus wants to make a little more money on each unit it moves, and a spec bump gives it the chance to increase the price without catching too much heat. You could argue that's not very kind to the consumer, but you are getting a better device for your extra $40 or $80. I'm sure some people won't even bat an eye at dropping $480 on the 128GB version so they can haul around tons of media. People buy OnePlus phones because they want good specs for a good price, and OnePlus is giving it to them with the Snapdragon 821. The OnePlus 3T is less of a good deal than the OnePlus 3 was at launch, but it's still a pretty good one. I don't think this phone would have come out at this price (or at all) if the Nexus phones were still around. Google's journey to the premium phone market has given OnePlus a confidence boost, essentially making it the biggest player in the budget flagship market. So, here's the bottom line: if you wanted to buy the OnePlus 3 before it went out of stock, you should still spend the extra $40 on the OnePlus 3T. If you have a OnePlus 3, keep using it.